For the past few months, we’ve been eating butternut squash (courge butternut or doubeurre in French) like it’s going out of style. And we should. In Europe, butternut squash is considered a légume ancien, that is, a forgotten vegetable. While winter squash are nowhere near being ignored in France today, the season will shortly be coming to an end, and our vegetable vendor won’t be selling them for much longer. Thus, instead of buying half of a medium-sized squash, like I usually do, I went for an entire, rather large one at market this weekend. Basically, we’ll be eating squash (in all it’s forms) for the rest of the week. The easiest recipe is soup. I scoop out the seeds, sprinkle with olive oil and bake in the oven until I can stick a fork into the squash. I once tried cutting up and peeling a raw squash, but that’s difficult and too time consuming. Once it’s finished cooking (about an hour for the size squash I had this week), I let it cool enough to scoop out the meat (do we say that for a vegetable?) and finally blend it up with a hand-held mixer. Sometimes I’ll add a little water if it’s too thick and maybe a little sea salt and/or pepper, but that’s it. I could put in curry spices, but the squash I’ve been getting lately is so sweet and naturally tastes like butter (thus the name) that I can eat it in spoonfuls as is. Such simple recipes are wonderful, but sometimes it’s fun to get more complicated. Thus, I tried my hand at making veggie burgers. Last week, I replaced the sweet potato in this falafel recipe with butternut squash, and that was one of my inspirations for these Butternut Squash Hummus Burgers. A friend recently introduced me to this food blog and Emily’s Chickpea Hummus Burgers. I sort of combined the two recipes and added a few pinches of my own to get my vegan/gluten-free patties. They turned out being flavourful enough on their own that I didn’t put them on a bun and decorate with toppings. I’ve just been eating them alongside whatever else is on the dinner table. I still have some patties ready to go in the fridge (and a small batch in the freezer). I might accompany them with the parsnips I have waiting to be cooked, or the red quinoa hiding behind the lentils in the cupboard. In a food processor, combine oats and seeds. Add the chickpea flour, garlic, tahini, lemon juice and olive oil. Combine and set aside. In a large bowl, mash the squash and broccoli (if using) with a fork. Combine all ingredients with a fork. Don't overwork, as chunks are nice. The dough may be wet and sticky. 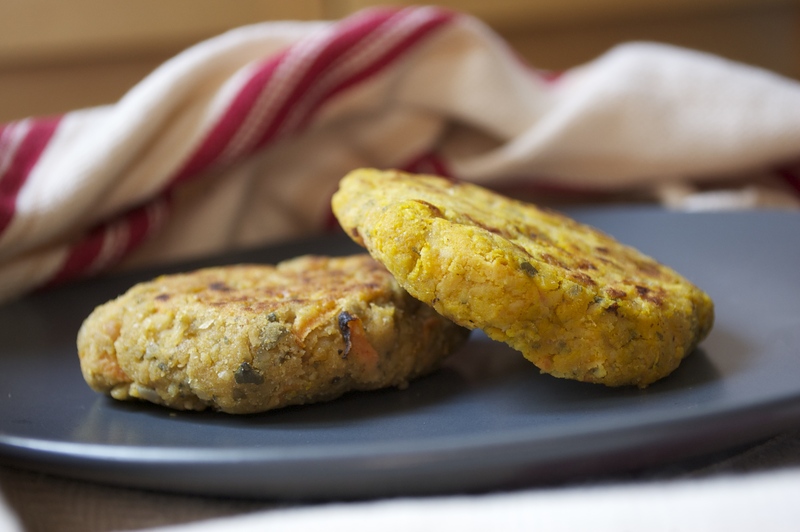 Pat your hands with chickpea flour and form the mixture into patties. Add a little more flour as you go if needed. I got about 8 small burgers from this recipe. Cook on a warm skillet (I used cast iron) with a little olive oil. This entry was posted in Recipes (All), Recipes (Gluten-free), Recipes (Vegan) and tagged mains, soups, spices, vegetables. Bookmark the permalink.